I am off work this semester, being treated for two things: an infection affecting my heart and abdomen; and a tumour on my kidney. I was in hospital 17 Dec—2 Jan, and self-administered antibiotics as an outpatient 3 Jan—29 Jan. The photo shows me partway through self-administration, which required 90 minutes each day. The infection of my heart and abdomen appears cured, and I am feeling much better. I am awaiting an appointment with urology. It is likely the kidney will need to be removed. The tumour, I am told, is too small to have metastasised. I will have better information once I meet my urologist, but my current guess is that I will be back at work sometime in March. My thanks to the NHS and to the Western General Hospital for the excellent treatment I have received, and to all my colleagues for their support. I hope whatever remaining treatment you have goes smoothly, and you are back to full health quickly. Yes, good luck and good health! Wish you all the best and good health, sir. Bloody hell! Get well soon! Best wishes! All the best for a complete recovery. Good luck. Dear Philip, I wish you a prompt recovery. 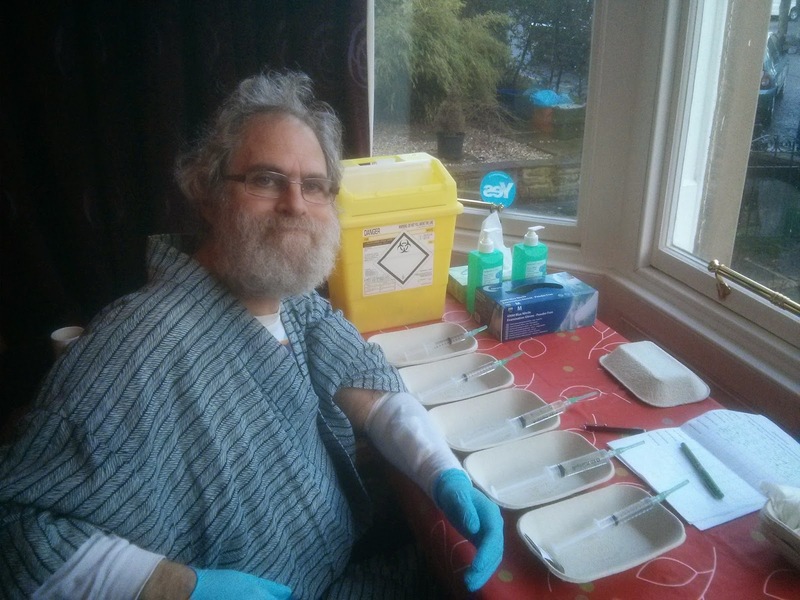 Hope you feel better soon, Professor Wadler. Your positive outlook is inspirational! Hi Phil! I wish you all the best for your recovery!! !